There are many ways where one can be stranded on a deserted island due to shipwreck or crash landing or some tourist spending time on a beach h with tropical blue waters without any shade over their head or a meal or water while enjoying their your holiday. But still too there are chances of survival if certain simple procedures are followed, otherwise the deserted island paradise becomes a worst nightmare. Always have a positive frame of mind when you find yourselves in a survival situation. Calmness, adaptability and clear thinking will make you go through the rough phase of life. You can lose control and end up losing your chance of survival. Always thrive and be able to greet your rescuers with a smile and a full belly. First thing is if you have crash landed on the island see if any injuries have affected you.Treat them as soon as possible since in the tropics any cut can quickly go sceptic and result in gangrene. Look around for safety precautionslike the area you are in is safe, are there wild animals and risk of flooding. 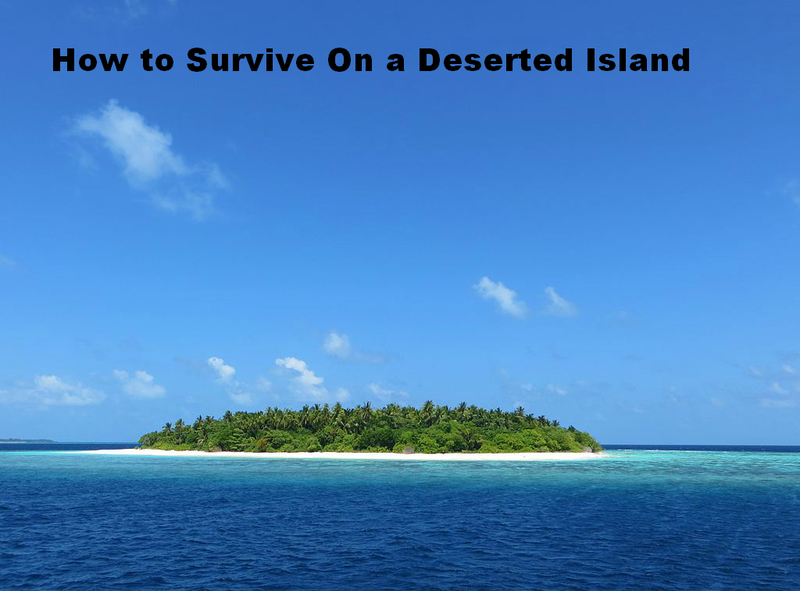 Finding drinkable and fresh water is the top priority on a deserted island which can quench your thirst, keep you alive even if living without food. There are ways of storing water like setting up water collection devices. Shelter spot has to be found so that one can relax under the shade. if there is no shelter then if you have a raft lean it up against the a rock wall , put some branches of leaves on top of it .Always build your shelter on the beach so that one can run out quickly to signal passing boats or planes. Make a fire place around the shelter so that you will not come in Contact with the insect and snakes. Food can be found in plenty like the molluscs, oysters,clams,mussels,seaweed and fish can all be eaten, but some care should be taken to see that is not poisonous, for that there are certain ways to find out by rubbing the food over the back of your hand and wait for some time to see if there is any reaction. Fruit and vegetable are also found, where one can roast and eat. Be careful about eating berry, mushrooms or certain plants which can be poisonous. To be noticed by the rescuers build a big fire on the highest shore point, where the fire is most visible. Create several fire piles that you can light quickly one after another. Go around the island in search of materials that will reflect the sun and use them to signal passing planes to boats. The main important thing is if you’ll are in a group act on all approved ideas together. Everyone should work together to ensure that all needs are met and to ensure that all resources available are put to good use. Will power is what allows people to survive without food for weeks. Without the will to live you won’t,if you give up that will be the end.